Table lamps can be as decorative as they are practical. When carefully purchased, the right table lamp can do wonders for your living space. This table lamp buying guide helps you pick a lamp that’s scaled to your space and has the features you want most. How high should a table lamp be? Selecting the right size table lamp is an important part of decorating a space. A table lamp that’s properly scaled in a room looks better and prevents the light from shining into your eyes. 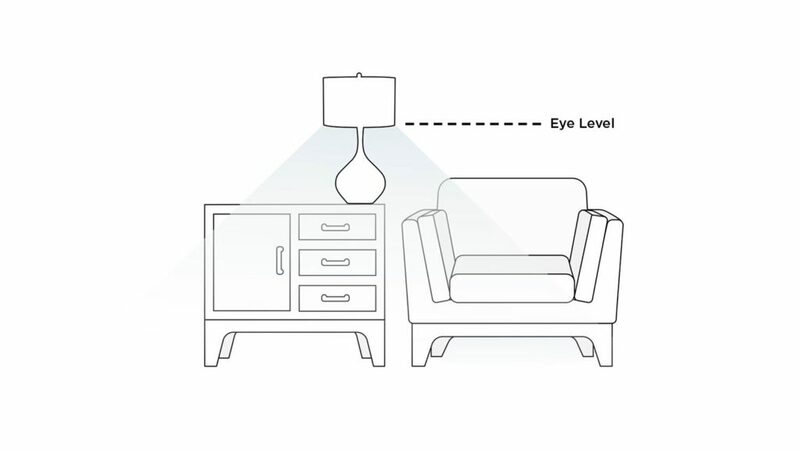 So when deciding on a table lamp height, consider the eye level rule. 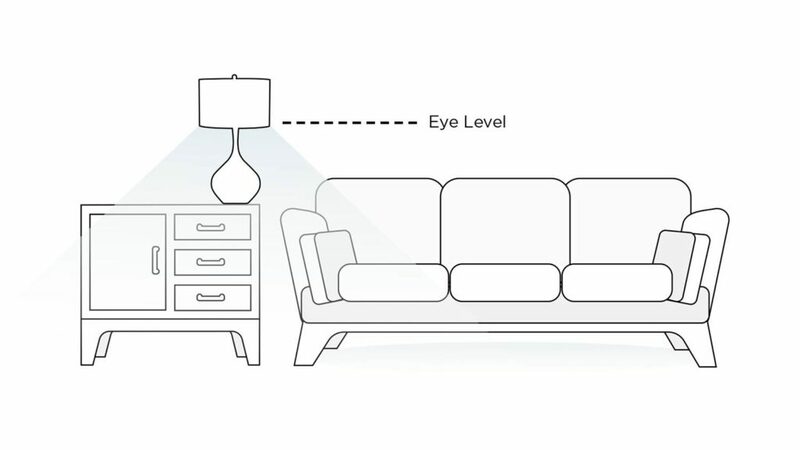 When sitting on a sofa, the bottom of the shade should line up with your eye level so that the light isn’t shining directly into your eyes. The same rule of thumb applies while sitting in a chair. The bottom of the shade should line up with your eye level. While sitting in bed, the bottom of the lamp shade should line up around chin level. This will ensure the light isn’t shining directly into your eyes. Buy a table lamp with a shade that is smaller than the width of the table. This ensures that the shade isn’t sticking out beyond the table. Table lamps are decorative elements as well as practical lighting solutions. When shopping for table lamps, look for color and design as well as your must-have features. If you want to light your way at night, consider buying a table lamp with a night light. 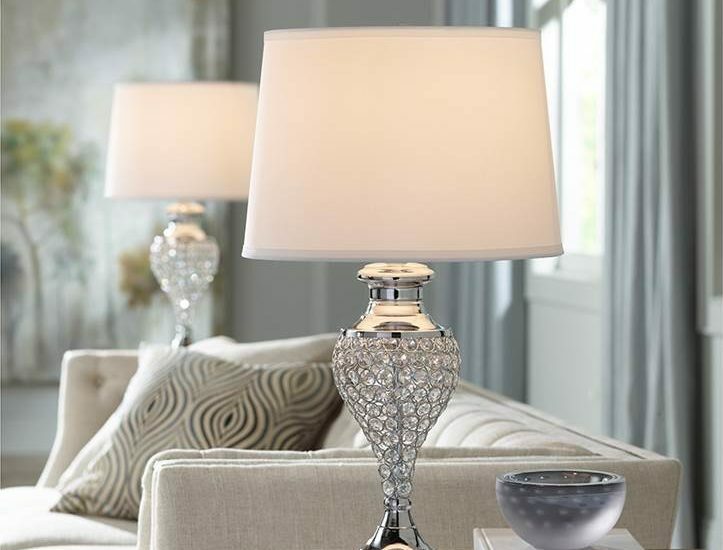 These table lamps offer ambient, or overall lighting, when all light features are on, and accent lighting when just the nightlight feature is being used. Table lamps featuring double pull chains provide you with two levels of light. Turn both on for reading, use just one for TV watching or general room illumination. In general, pull chains are easy to reach and use, making them a good option bedside or for next to a reading chair. For a handy way to charge electronic devices, purchase a USB table lamp. A pair of table lamps offers a unified look for entries, bedrooms and living areas.